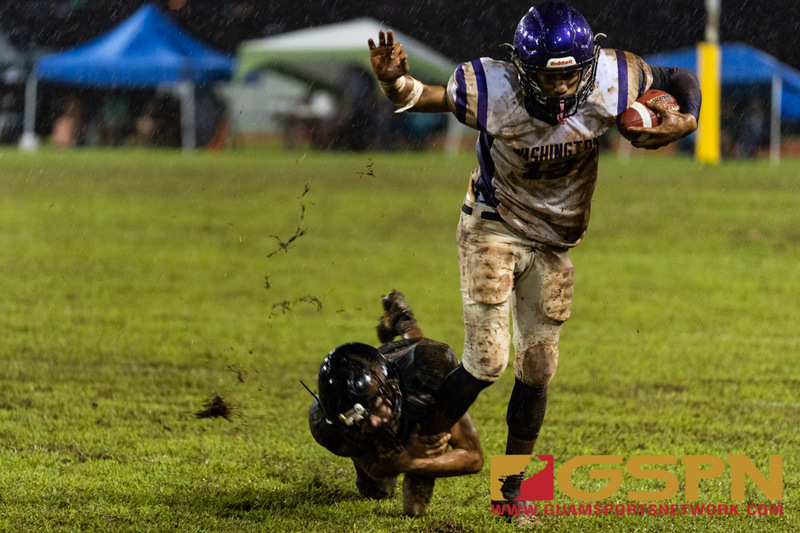 The GW Geckos are closer to solidifying at the second seed in the IIAAG Football League after defeating the JFK Islanders 7-0 at JFK in a wet and wild Friday night. The rain drenched the field as both offenses had a tough time keeping possession and getting into any rhythm with nine total turnovers in the contest. The lone touchdown came early in the first quarter before the mud became a favor with Aaron Jamanila completing a pass to his first cousin Dominador Jamanila III. Ricky Macias’ extra point kick would be the last points for the game as both defenses thrived under the wet conditions. “We actually worked on that play in practice and feels good to see him get his first touchdown,” said Aaron Jamanila. Aaron Jamanila received a reverse pass from GW quarterback Macias and he had no intention of running the ball. Instead, he dropped back and found his wide open cousin Dom Jamanila in the end zone for an eight-yard touchdown score. Three Islander defenders looked to make a tackle on the all-island wide reciever (Aaron), but he played quarterback and floated the pass to his primo waiting wide open in the end zone. After the GW touchdown, both defenses thrived to close out the half. Finding no success on the ground, JFK went to the air, but the wind factor caused an errant pass that was snatched by Aaron Jamanila. The Geckos tried to go to the air as well on the ensuing possession, but JFK defensive back Quintin Kakas anticipated a pass to Aaron Jamanila and recorded an interception. Both teams tried to run the ball, but the wet conditions slowed the speedy running backs on both sides to settle for minimal yardage. The GW running back duo of Shelby Meeks and Jesse Manglona were unable find proper traction on the muddy field and they combined for 109 yards and three fumbles. JFK’s running back Deante Delgado also had a tough time making cuts but still managed to run for 54 yards on 12 carries. The Islanders were unable to get into the red zone with GW linebacker Jon Espino making plays at the line of scrimmage. Espino continued to pad his stats in the second half with JFK unable to advance the ball to GW territory. The GW defense recorded five total turnovers which included a pair of fumbles both recovered by Christian Cabrera. Cabrera’s second fumble recovery was huge with less than a minute left in the game. Macias took a knee after the turnover as the clock expired. “This is football on Guam, you have to play rain or shine and adjust to it. I’m proud of our defense, they played really well today against a very talented JFK team,” said Aaron Jamanila. JFK’s defense was just as strong, forcing three fumbles in the second half. Lawrence Tisalona forced a fumble deep in Islander territory in the third quarter to keep within striking distance. The Islander defense did their job in the second half, but the offense was unable to get into the red zone. The Islander offense was held to under 100 yards for the contest. Last seasons defensive MVP Chase Spotanski led the Islanders in tackles with seven total, two of which were for losses. Linebacker Justin Camacho and Tyler Aguon each recorded six tackles for JFK. Aidan Quitugua and Jacobe Quinata were also solid on defense with four tackles each. Meeks had 61 yards to lead GW on the ground, Manglona rushed for 48 total yards. Gw fullback Jose San Miguel had seven total carries for 32 yards. San Miguel was called upon on fourth-and-short situations twice and converted both first downs to extend GW drives. Macias completed five passes for 42 yards, Trystan Guerrero caught two passes for 20 yards to lead GW. Espino had a game high nine tackles, two of which were for losses. James Crisostomo had four tackles, Cabrera had three tackles and two fumble recoveries. The victory moves the Geckos into sole possession of second place (3-1), trailing the undefeated FD Friars. “We are getting stronger after every game, we hope to reach our peak by the playoffs,” said Espino. After winning their first two games of the season, the Islanders dropped their next three games and fall to 2-3. But don’t sleep on the Islanders who had a shot to win their last two games in the final moments of each contest.